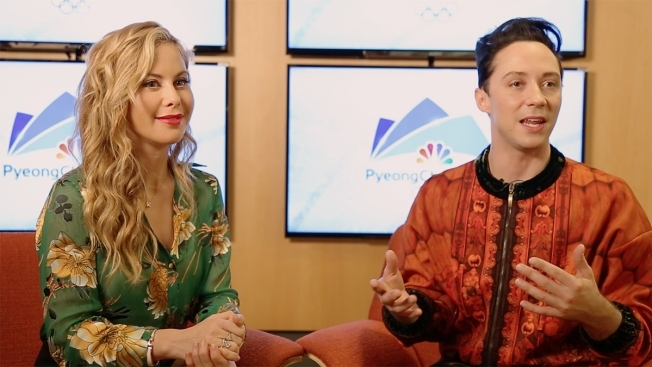 Athletes at the 2018 PyeongChang Games might have some of the most technologically advanced competition suits in the world, but two-time Olympian-turned-NBC figure skating analyst Johnny Weir might have the sharpest duds in the Olympic Village. Weir, who represented the U.S. in figure skating at the 2006 Torino Games and the 2010 Vancouver Games, previewed his second “look of the day” outside of the Gangneung Ice Arena on Instagram on Sunday. He went for another leather look with an all black blazer, black leather pants and sharp pointed shoes. Weir wore a jeweled harness to add a special flair that he is known for. On Friday, Weir posted his first "#OOTD", outfit of the day, which featured a pop of red from Italian fashion brand Redemption, and Weir’s Christian Louboutin shoes combine both the black and red from the rest of his outfit. If Weir’s history of fashion choices is any indicator, the Olympic Village is in for a treat over the next few weeks. Weir is known for his eccentric and loud style, like the multiple sparkly blazers or the golden Coach hair piece he wore during the 2014 Sochi Games. After Weir’s two Olympic Games, he joined NBC to commentate figure skating for the 2014 Sochi Games. Now with analyst partner Tara Lipinski, a 1998 Nagano Games figure skating gold medalist, Weir is back for PyeongChang – this time in Primetime. Weir, who plays as hard as he works, has been posting up a storm since arriving in PyeongChang, especially on the Instagram account he shares with Lipinski (@taraandjohnny).